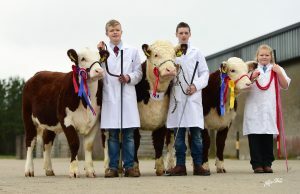 Saturday 29th October saw the NIHBA United Feed’s National Calf Show take place at Dungannon Market. 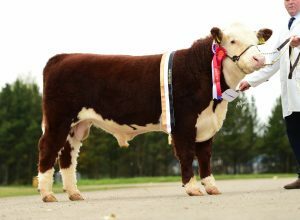 16 Exhibitors brought forward over 30 entries to be judged by the experienced Matthew Gray from the Buckenhill Herd, England. With a packed ringside looking on the youngstock went under the expert eye of the judge who was delighted to see such a great turn out of quality that is sure to dominate the show circuit over the coming years. 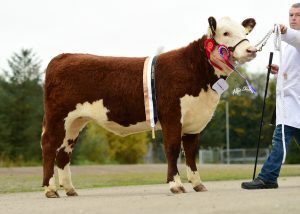 Overall Male Champion went to J&W McMordie with Solpoll 1 Nomad. 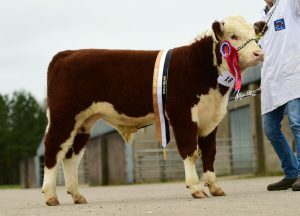 The September 15 born bull yet again from the winning combination of Panmure 1 Henry and Solpoll 1 Starlet J15 took victory in the bull section. “Class, quality, well balanced” stated judge Matt Gray. The overall Female Champion Title went to Co Antrim Breeder Trevor Andrews with Mountview 1 Estelle. 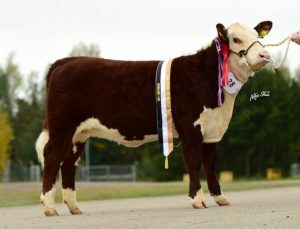 This home grown heifer showed great ring presence and feminine quality, truly worthy of heading the female line-up on the day.